The data for Sentinel 5P was made available on 11th July 2018. With a resolution of up to 7×3.5 km, it enables detection of air pollution over individual cities. This is a ground breaking sensor and is offering unprecedented measurements of our atmosphere. If you want to know more about this sensor, I have previously written here about why Sentinel-5P is important. Stunning images and, behind it, science that informs and excites. All with the free and open policy of Copernicus; this is a golden age of satellites. The data is now available to download from the scihub here. It is currently in the ‘Pre Ops’ phase so we can expect improvements shortly. At the time of writing there are no quicklooks on the data available, but if you are already familiar with downloading Sentinel 1,2&3 data, navigation is identical. Sentinel-5P data is supplied in .nc format. This means netcdf 4. I downloaded an NO2 level 2 file from the sci hub that covered the UK. The file is an image from 16th July 2018. I should add that the ever impressive SNAP toolbox was also able to open and view this data. However, I wondered if I could access it in Python. This is new data from a new sensor and I couldn’t find much about doing this so I wondered if I could inspect and plot the data. It turns out it is simple to do and I’ll show you how next. Test to see if you can import the library; if you get no errors you are good to go. Print (fh) to see if the file has been loaded. This should return a lot of information about the file, such as when it was acquired, what sensor and its version, among many other things. Next, let’s drill into the data. By printing the fh.groups we can find the groups in the data, which are called ‘PRODUCT’ and ‘METADATA’. By printing fh.groups[‘PRODUCT’] we find the product has data about the dimension and variables. …we will finally get information about the data itself. You will see that the data has a value called current shape which we can convert into a numpy array. I am indebted to the following post for the remaining code: http://joehamman.com/2013/10/12/plotting-netCDF-data-with-Python/ I have made only a few slight changes, otherwise I replicate it below. The main change is that the above blog assumes a 2D array and the Sentinel-5P data output is a 3D array so we need to use the [0,:,:] code to slice it to a 2D array. If in doubt print the shape. The final line gets the units of NO2 so I can add to the plot later on. 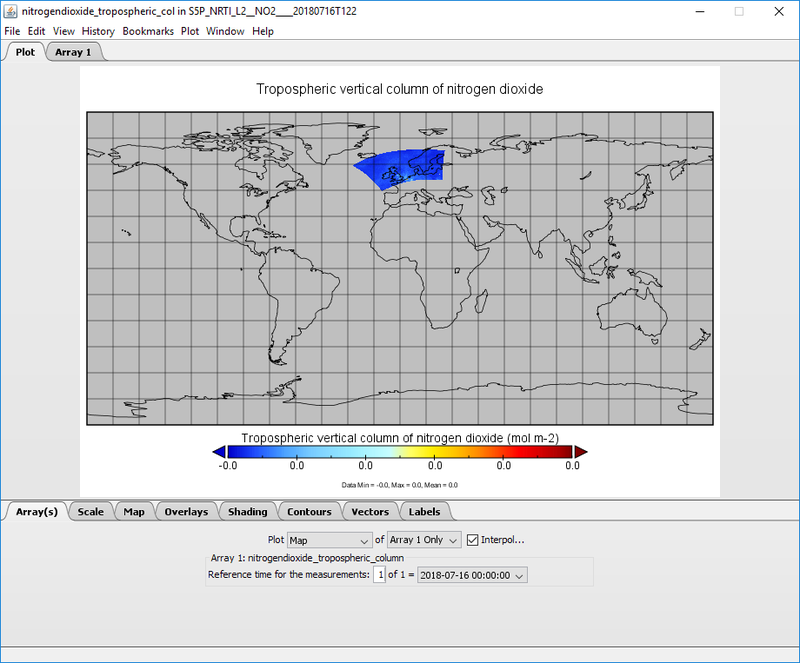 I am using Matplotlib to make the plots in a Jupyter Notebook, so I need to use the inline command at the start of the script; the final import helps plot the basemap using the mpl_toolkits.basemap. The final part of the code is taken entirely from the blog post listed above. This creates the following plot from the nitrogendioxide_tropospheric_column_precision variable. Europe is being imaged everyday now so it should be posssible to build a timeseries or to zoom into an area of interest, for example the south of the UK. I am very excited about this sensor, I can see huge potential. The code for this walkthrough is available on my Github page here. Using the netcdf4 library Python can read, inspect and finally plot the data in matplotlib. I don’t claim to be an atmospheric scientist, this is just a guide as to how to access the data. I hope it is helpful. This entry was tagged Earth Observation, python, Sentinel-5P. Bookmark the permalink.